Welcome to the River Valley Stables. River Valley Stables will be closed from 1st June 2019 – 16th September 2019 for the winter season. This is to give our horses a well deserved break, and to avoid the wet slippery slopes. We are still taking bookings for next season, starting from the 16th September. Experience the freedom of riding using natural horsemanship techniques encouraging communication between horse and rider. All our horses are ridden bit less and barefoot. No metal in their mouths or on their hooves. River Valley Stables has something for everyone – from a half day trek, to a multi-day horse riding holiday. We offer adventures for riders of all abilities, from beginner to experienced, and our packages can be tailored to suit you. Check out our various horse trekking options below to see which trek will suit you best. Alternatively, email our Sales Consultants on [email protected] who can help in matching your abilities and desires with the right adventure. A 2-hour ride that explores the trails through the foothills of Pukeokahu, a local landmark meaning Hill of the Hawk. At last a ride for experienced riders! Now you can get out and have some real horse time fun. This is a half day ride that moves along, exploring longer trails, with lots of opportunity to canter your horse. Experienced riders only. A full day ride exploring the enchantment of the unique countryside this part of the world has to offer. You need to be comfortable in the saddle at all gaits to really enjoy this. A beautiful evening ride taking in the dusky light fading over the hills. Enjoy a glass of bubbles and a picnic along the way. This ride is for all abilities. It’s a good place to start if you’re new to horses. A half day adventure, honing your horsemanship skills followed by a horse ride out into the picturesque country side at River Valley. A full day horsemanship experience. Combining a challenge packed horsemanship arena session with the opportunity to put into practice what you’ve learned as you explore the foothills of Pukeokahu. Find out more about our philosophy and why Natural Horsemanship is at the core of everything we do at River Valley Stables. A 2-day adventure with a demanding ride by day, followed by a touch of luxury by night. This ride takes you down into the spectacular Rangitikei river gorge, crossing the river several times before reaching your destination. Build your own holiday honing your natural horsemanship skills and exploring the spectacular scenery on horseback. 2,3,4 day options. Coming Soon – Please email [email protected] to register your interest. It was hard not to feel welcome there, everyone was friendly and it felt like being at home with a big family. Imagine you will, a trip entailing a trail ride ambling through stunning countryside, a quartet of horse treks across gentle and challenging terrain, and a beautiful lodge cocooned in a valley, alongside a raging river, where you feel like you’ve just dropped off the edge of the planet into another world. So thank you River Valley Stables for making my time there an unforgettable experience. Maddie – To read Janet’s full experience click here. For me, it was a fulfillment of a childhood dream to be able to ride over country like that, with the added bonus of great company. The photos have come out really well and I will email them on when we get them loaded onto the computer. Give my love to Bling. No doubt you are very busy now. I have already recommended a number of people to come to you to stay. Thanks again for everything and giving me one of the best days of my life. The group consisted of my mother, myself and our guide Janey, and we were not stuck behind one another in a set order as they do in other horse treks. We were free to roam as we wished in the vast pastures! I also did my first jump in at least 5 years (which ended hilariously)! All in all a wonderful and eye-opening experience well worth the time, money and 45 minute drive from the main road! Mandy Pittman – To find out more about Mandy’s experience click here. Why Work With a Young Horse's Feet? River Valley Stables has a program of breeding its own horses. Horses suited to trekking and having riders on their backs with a diverse range of riding skills. Young Horses need a great deal of ground work. That is a person working with them to gain their trust, and familiarise them what will come to be expected of them as a working horse. Here Nicola works with 18 month old Calibre's feet, at River Valley Stables, as she readies him for his first experience with the Farrier. On the first weekend of June 2013, Ken Dromgool, of Dromgool Horsemanship, held his first clinic at the River Valley Stables sand arena, near River Valley Lodge. We caught up with Ken at the conclusion of the clinic to get his thoughts on how it had gone, what he tries to achieve, and what future participants need to work on. 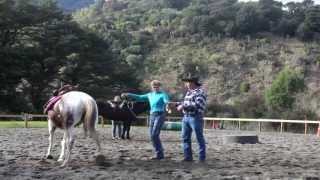 The basis of the way in which our trekking horses at River Valley Stables, (Taihape, New Zealand) are trained is using natural horsemanship techniques. Why? Horses trained using these techniques appear to be more forward moving, responsive, quiet, and be much happier. In this video, Nicola is working with Rico, and putting him through a number of games and patterns. It is not Rico who is doing all the learning, but also Nicola. Speak to one of our friendly adventure consultants who would love to help you out.